West Ham United Football Club is an English professional football club based in Upton Park, Newham, London, currently playing in the Premier League, England's top tier of football. 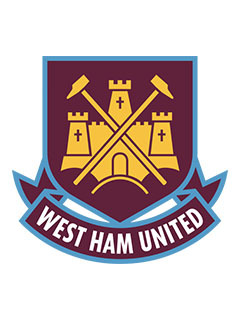 The club was founded in 1895 as Thames Ironworks FC and reformed in 1900 as West Ham United. In 1904 the club relocated to their current Boleyn Ground stadium. They initially competed in the Southern League and Western League before eventually joining the full Football League in 1919 and subsequently enjoyed promotion to the top flight for the 1923 season. 1923 also saw the club feature in the first FA Cup Final to be held at Wembley against Bolton Wanderers. In 1940 the team won the inaugural Football League War Cup. The club have won the FA Cup three times: in 1964, 1975 and 1980 as well as being runners-up twice, in 1923 and 2006. In 1965, they won the European Cup Winners Cup, and in 1999 they won the Intertoto Cup. They are one of eight clubs existing today to never compete below the second tier of English football; however, unlike the other seven, West Ham has never won the league title. The club's best final league position is third place in the 1985–86 First Division. Three West Ham players were considered an important factor behind England's triumph in the 1966 World Cup. England's captain at the time was West Ham's Bobby Moore, and both goalscorers in the final were then current players Geoff Hurst and Martin Peters.